The iconography of the Annunciation derives primarily from the canonical Gospels of Matthew and (above all) Luke (1:26-38), but also from the apocryphal gospels, such as the Gospel of the Pseudo Matthew and the Protogospel of James (11:1-3). These apocryphal gospels were divulged in the West by Vincent de Beauvais (1250 ca.) in his Speculum Historiae and by Giacomo da Varagine (1260 ca.) in his Leggenda Aurea. Another apocryphal source is the Armenian Gospel of the Infancy which had a significant influence on Byzantine iconography. According to the apocryphal gospels, there were two annunciations. The Armenian Gospel (5:2-9), for example, says that the Virgin was initially greeted by an invisible angel as she left home carrying a jug on her way to fetch water at the fountain. Fearing that the devil was trying to trick her, Mary began to pray, asking God to free her from the temptations of the devil. Then, upon returning home, she begins spinning the purple veil for the temple. Gabriel then enters through a closed door and appears before her, this time as a being of flesh and blood, announcing that she will give birth to the Messiah. At that moment, the Word of God penetrates her through her ear, beginning the act of conception. Among the earliest representations of the annunciation in Christian art are the frescoes in the catacombs in Rome, where [the] funerary art was a “prayer”, a witness to hope. Particularly significant was the message of Christ’s victory over death. The annunciation to Mary is the very beginning of this message. The oldest image of an annunciation is a fresco on the vault of a cubicle in the catacomb of Priscilla, dated to the first half of the 3rd century. Mary is wearing a tunica and pallium according to the roman fashion. Seated on a high-backed chair, she is listening to a man in front of her, to the right, who is wearing a tunica with wide sleeves. He is raising his hand in the loquendi sign, i.e. the sign of speech. In this fresco, Mary is without a veil. The introduction of a veil in her representations comes at a later date following the fashion of the oriental omophorion (a veil that is worn with a dark blue cape). Yet, Mary will also continue to be depicted without a veil and with her hair down, as a sign of her virginity (unmarried women wore their hair this way). The angel’s gesture of orator will sometimes be replaced in later depictions by his raised finger, indicating the provenance of his message. The fresco in the catacomb of Priscilla follows the then contemporary iconography representing a messenger in the presence of some high-ranking person: remaining seated while receiving a visitor symbolised the person’s dignity. The fact that the divine messenger is featured without wings in early Christian iconography is probably an attempt to distinguish Christian angels from the “winged victories” of pagan religion. As I have already mentioned, the annunciation to Mary is somehow the beginning of God’s plan to redeem humankind through Christ. However the annunciation is not depicted exclusively in this light. Over time it becomes increasingly used as a message pertaining not only to salvation, but also to revelation: the mystery of Christ is first revealed to Mary. Mary is considered to be the first witness to God’s love taking shape in the Incarnation. Thus, in the 4th and 5th centuries, the annunciation becomes part of a much wider context. It starts to be included in cycles of epiphany scenes relating to the first manifestations of Christ to humankind. The epiphanic nature of the annunciation is often emphasized by the presence of a curtain, which is used not merely for decorative purposes but also for its symbolic reference to revelation. (In this context, it is worth remembering that the curtains in the sanctuaries of some pagan “mysteries religions” hid the sacred image until the moment of the theophania, i.e.the appearance of the divinity, when they were pulled open). The feature of the curtain was introduced in the iconography of Christian martyrs towards the end of the 4th century. The first example is the portrait of the Saint in front of the Confessio of the Basilica of Ss. John and Paul in Rome. With the passing of time, the attention focuses more and more on the nature of Christ and the dogmatic importance of his representation, as true God (the Council of Nicea in 325 declared that the Father and the Son are consubstantial; the Council of Ephesus in 431 proclaimed that Mary is the mother of God) and true man (the Council of Chalcedon in 451 declared that two natures –human and divine- coexisted in Christ). Yet, it is above all the divinity of Christ that the victorious Church wants to stress (it is after the Edict of Theodosius in 381 that Christianity becomes the official religion of the empire). Mary acquires a nobility and a regal nature of clearly imperial inspiration. The regal nature of Mary is naturally due to the regal nature of Christ, increasingly represented as Christ in Glory, who will judge humanity at the end of time. In the 5th century, in the mosaic of the triumphal arch in Santa Maria Maggiore in Rome, a flying dove appears for the first time in an annunciation, symbolising the Holy Spirit. In the Bible, the manifestation of the Holy Spirit as a dove can be found only once, namely in the account of Christ’s baptism. However, the Council of Nicea in 325 declared that the dove of the baptism was a valid symbol for the Holy Spirit. From then on, the dove will be depicted above all in the annunciations of Mary and then later in the scenes of the Pentecost and eventually in the images of the creation and the Trinity. It should be said though that the depiction in Santa Maria Maggiore remained for a long time a unique example, perhaps due to the aversion towards the still existing cult of Venus which also used the dove as a conventional symbol. Four hundred years would have to pass before this symbol took hold in Christianity: it became a fully integrated part of the annunciation iconography in the 11th-12th centuries. In the 6th century, we witness a reversal in the positions of Mary and the angel. Mary begins to appear on the right of the scene. The main figure has thus been moved, following the direction in which Greek and Latin are written and read (from left to right), so that the eye stops on the image of the Virgin. The angel Gabriel is portrayed usually alone, facing Mary, holding a rod or a sceptre, the symbol of the staff of command that God – the celestial emperor – entrusts to his special ambassador. However, there are exceptions. Sometimes the scene introduces more than one angel. 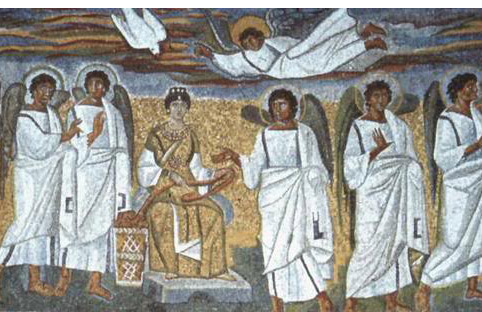 For example, in the above-mentioned mosaic of Santa Maria Maggiore, four angels surround Mary. Yet, it is after the Council of Trent (1545-1563) that we begin to see an increasing number of angels and a multiplication of little putti. The seat of the Virgin, who is often depicted resting her feet on a footstool, is covered with an imperial cushion. At times the seat becomes an actual throne. We frequently see an aedicule with a gable above it, suggesting the idea that the Virgin is the “dwelling place” of the Most High, and the symbol of the Church itself. Emotions are not portrayed in these images. Gestures, on the contrary, have a highly symbolic value. Mary’s hand can assume several positions. When she holds it to her chin, it is a sign of reflection. Her palm facing outwards suggests her initial reserve. The back of her hands held to her chest indicates her consensus. The gesture of the orans (praying figure) is also highly significant, with the palms of her hands facing outwards at chest level, as a sign of trusting welcome. Iconographically, the image of the orans was borrowed from the image of the Roman pietas which represented devotion and respect towards the gods, as well as towards one’s family and nation. Besides the byzantine tradition featuring Mary seated while spinning the purple veil for the temple, we find a different iconography. In the 6th century, the Virgin begins to be depicted in a standing position in the act of speaking. This image is influenced by the byzantine-hellenistic regal tradition, which wants to emphasize not only the nobility but also the wisdom of the Virgin, who instantly recognises the true nature of her visitor, rises to her feet out of respect, and is able to answer him after listening to his message.